This outfit, worn on the last Saturday of our pop-up shop, is a good illustration of the kind of clothing that excites me at the moment. It could be defined, perhaps, as casual but luxurious, muted but refined. Casual, in that there’s no jacket, shirt and tie - and that the shapes are all relaxed and comfortable. Nothing is sharp or tight. And yet it’s no less luxurious than more formal clothing, with thick cashmere knitwear, Fox flannel trousers, and top-end leather shoes. The colours are muted. Yes, cream is quite bold, but there are no strong colours anywhere, and the most pleasing aspect is probably just the tonal combination of cream, brown and grey. An alternative menswear uniform to white, navy and grey, perhaps. And I call it refined because there is such close attention paid to those colours - as well as the materials that hold them. The brown flannel trousers have to be dark and cold - Fox calls it char-brown. 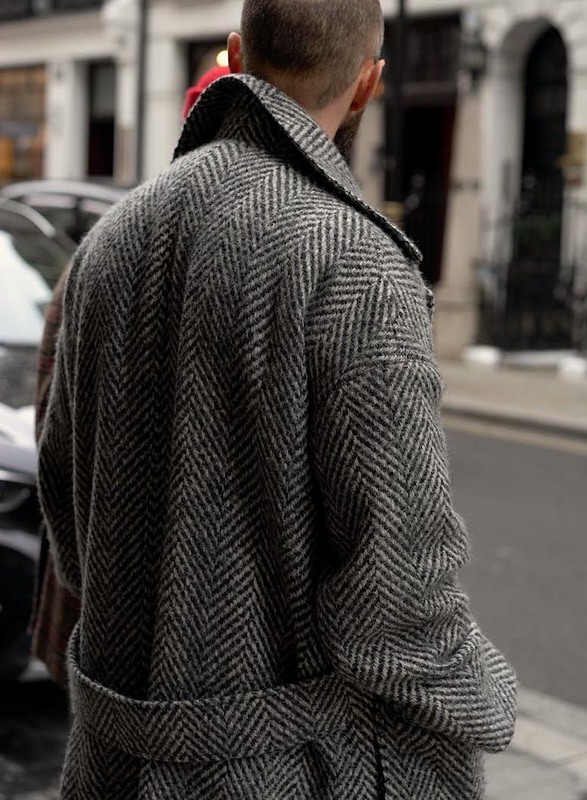 The grey of the coat can’t be too similar to either the brown or cream, but sit somewhere in between. And that coat needs pattern - otherwise nothing in the outfit would have any. The coat and knitwear, being from Connolly, both have some fashion-forward details. These appeal to me at the moment. Each has a slightly dropped shoulder, the coat has a big, rolling collar, and the sweater has an unusually long cuff (which is very cosy on a cold day, but can be folded back too). The scarf at the neck (the ‘PS Square Scarf’, which I designed with Begg) is also a dandyish detail. But these details are not the central appeal of the outfit, and are easily changed. If you remove the scarf and replace the sweater with a classic design, you retain all the sophistication of the colour combination with none of the fashion. 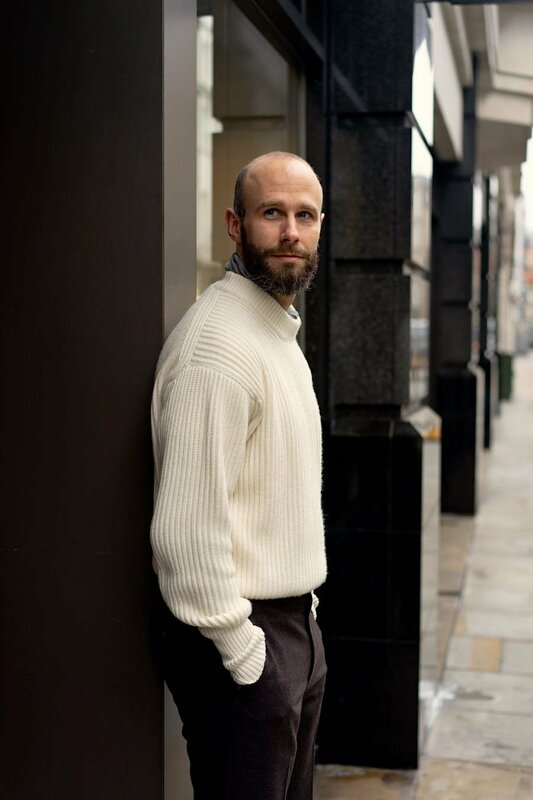 Pick a blue oxford shirt, a cream shetland over the top (Trunk has some nice ones), brown flannel trousers and dark shoes, and you have something suited to a casual office, yet a little different to standard menswear combinations. I can even see the loafers (Belgravia model, Edward Green) replaced with a black equivalent, given the relative coldness of the outfit. I’ve got my eye on black-cordovan ones (EG Greenwich model), though Alden would be a lot cheaper, even outside the US. The sweater is the Gigi model from Connolly, bought two seasons ago. Unfortunately cream isn’t currently available, but navy is. The coat is also not available, although again there are others in different colours. The trousers were made by Whitcomb & Shaftesbury and the cloth is Fox CBT5/R1285/39 (13/14oz). PS Square Scarf in grey here. I don’t think it’s any coincidence that my other two trouser commissions in the works are grey Spring Ram from Harrison’s, and brown covert cloth from Holland & Sherry. Both should slot into this tonal wardrobe nicely. You can follow the discussion on A Connolly tonal outfit: cream, grey and brown by entering your email address in the box below. You will then receive an email every time a new comment is added. These will also contain a link to a page where you can stop the alerts, and remove all of your related data from the site. I like this combo very much, but black shoes would kill it stone dead. Very nice, though would you be tempted to go with suede shoes? Do you not find that polished shoes clash a bit with more “matte” looking, tonal outfits? They just always seem that little bit more formal. Have you written separately about the coat anywhere? Can’t find it if so, but it’s very appealing. Suede shoes would have been nice, yes. It would have made the overall outfit a little more casual, but that could have been fine. Personally I don’t think polished shoes clash – they create more contrast, but that isn’t necessarily good or bad. Suede would have been fantastic with this outfit. Also, the EG Galway boot would work very well with this ensemble, adding a bit more of a masculine look. The more I study the color combinations, the more I like grey and brown together. Definitely veering in this direction also. Intrigued how you do so in the summer. Hey Simon, thank you for the alternative suggestion. If possible, could you recommend a maker for the knitted silk or cotton T-shirt that would be priced at a reasonable point being a t-shirt? Thanks! The collar of the coat looks very nice. Wondering whether it will stays so (collars on pics generally look better than in real life). The knit of the jumper looks great. I just find the cut too loose and would fear it gets even looser. I’ve been wearing both for a year, and I can safely say the collar and jumper haven’t changed, thankfully. Trying to think ahead and plan my summer wardrobe since warm weather is not that far off now. I like this outfit; there seemed to be a time when menswear writers would advocate for wearing a sports jacket or suit as much as humanly possible based on the idea that it was objectively the most flattering thing a man could wear. This may even be true, but the feeling or vibe given by clothes probably matters a lot more than that. Already sold out of Lighter denim shirts! Any more coming in? Hi – yes, though only in the Medium size, the others are available. I’m afraid we won’t be getting any more in soon, but there are Mediums in the normal Everyday Denim shirts, and Lighter Denim cloth. Also, if you email Support@PermanentStyle.com they can put you on the waiting list for a Medium. There’s a good chance we’ll have an exchange or return sometime in the next couple of weeks. Thanks, pinged an email over. 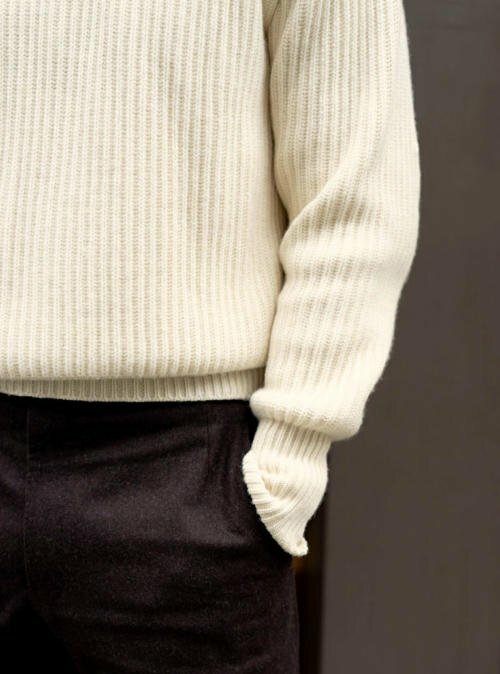 Love the color combination and the thickness of the knitwear. The dropped shoulder design however, has never really appealed to me, particularly with outerwear. What appeals to you about the drop shoulder look? But less subtle than a raglan shoulder, wouldn’t you say? Would raglan sleeves not do a similar job but less strange ? I really like the subtleness of this look, I’m a big fan of monochromatic outfits. Could you please elaborate on your use of “cool” in your description? In my world (art & design) the word cool when describing a color would be mean the appearance of blue, as opposed to red which would produce a warm color. Brown is almost always warm as it has the presence of red. Hi Robert. By colder colours I mean those that have less saturation, less red in the mix, and tend to be darker. There are lots of browns of course, and those with less saturation and less red tend to look colder I think. Sam points out the issue of the shiny shoes – I understand your response. 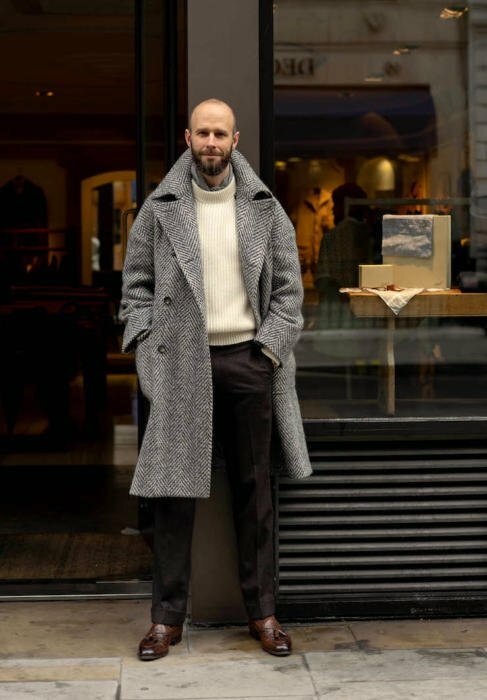 I think however, that the balance is slightly lost in the outfit as the thickness of the Connolly jersey and matte flannel trousers suggest an almost outdoor casualness that outweighs the shiny gentility of the loafer. I suggest a more casual (perhaps heavier) shoe (EG Weymouth suede shoes) or refined boot (EG Top Drawer/Tim Little Chelsea boots) would have given a better balance to the ensemble. I’d have thought you’d go for a pair of Bluchers/Derbies with that rig. The Belgravia loafers seem a bit out of place given the rest of the outfit. To my eyes, a double-soled pair of bluchers/derbies in Dark Brown or Burgundy would have set this off. I second the first commenter on black loafers on this rig. A non-starter for me. I find it interesting that you write luxurious almost as if the outfit would be generally only luxurious if it was formal. Just my opinion, based on the price of most things on PS, everything on here is luxurious…..Yes, I generally consider a luxury item based on price. Interesting point Joel. I say ‘casual but luxurious’ in that more casual wear tends not to be luxurious – jeans, t-shirts, sweatshirts etc. Luxury itself is a slippery thing to define today, as it’s gone beyond the literal meaning of something that is outside the norm for someone. I bought the Connolly Silk/Cashmere knit. 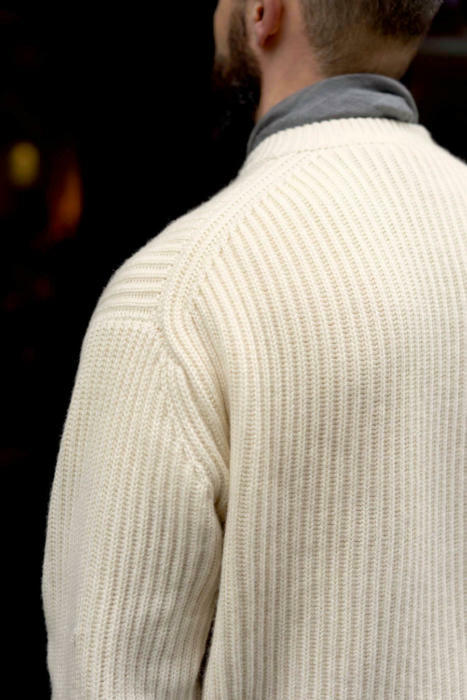 Sadly it didn’t look right on me so I sent it back, but it was the nicest feeling sweater I ever felt and now struggle to find anything that is cashmere/silk with a 50/50 blend. Luca Faloni have some very nice 70 cashmere 30 silk knits. Thanks, I have an N Peal sweater which is 70/30 too but there is something special about the Connolly sweater in the 50/50. I don’t know how to describe other that beautifully lustrous. Soft with a very smooth hairless feel. I think this outfit looks incredibly unisex. My Grandmother has a very similar coat. Personally I prefer a more masculine look. The perfect outfit for spring!! Agree with whoever talked about how wrong black shoes would be with it, and also with comment about the slightly delicate loafers you are wearing. Keep trying Simon! You will get it right in the end I am sure. Simon, on the issue of luxury: do you think legacy is also an issue? You mention jeans, sweatshirts etc. – these items, respectively, are from the spheres of workwear and sportswear and, even when expensive, are never quite seen as true luxury items. Your items, both made from natural, luxurious fibres, come from a legacy that is neither of these (almost pre-war ‘country house’ leisure wear). I also contest Jason’s unisex claim – how and what might change were it to be more ‘masculine’, given the normality of the outfit? 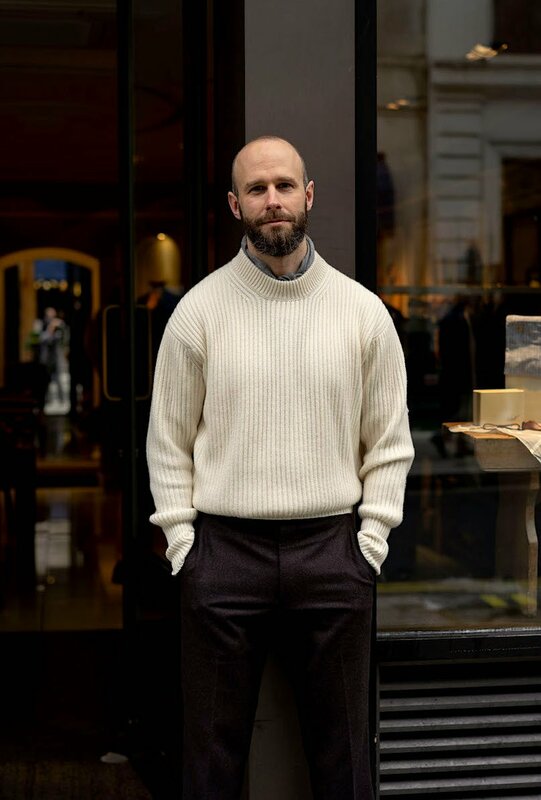 Knitwear and tailored trousers are a winter weekend staple for many men. So, for example, if the jersey were to be blue might this alter the impression? I think legacy is definitely an issue, yes, but it also depends on range of pricing. So jeans are unlikely to seem luxurious when you can get a pair for £20. Cashmere seems less luxurious too now. But certain looks and feels only come with more expensive quality. And yes, masculinity is very subjective and cultural. And often used as an excuse. Different topic: How can someone avoid discolouration on chinos (Khaki colour)? What kind of discolouration? Just the colour fading through wear? Or dirt, stain etc? Ah, well in that case it’s down to the trousers themselves and how they’re made, rather than anything you can do with aftercare. Trousers that are garment dyed, for example, are more likely to fade at the seams and wear points over time. That’s what they’re intended to do. Often that’s with things are more heavily washed or treated too. Tailored trousers made with dyed yarn are less likely to. The sweater is susceptible to moth damage – mine soon developed a hole. More susceptible than another normal cashmere jumper? Love your collection.thanks for sharing. What are your thoughts on climate range for the Spring Ram fabric? I don’t see much online about how cool/warm it wears and what I have seen seems conflicting. I’m not worried about it being scratchy so lining isn’t a necessary consideration. As always, appreciate your input.